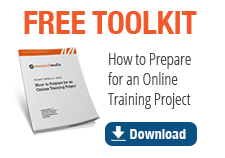 Today, organizations regularly face challenges involved in creating and implementing an online training project. So where should you begin? 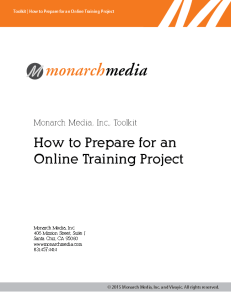 Monarch Media has designed a toolkit for taking your training online which will lead you through the key considerations to help you start developing a plan to achieve your goals. This toolkit includes an assessment of your learning needs, an opportunity to identify action steps, and ways to support you and your organization in the strategy, authoring, design, and implementation of your project.